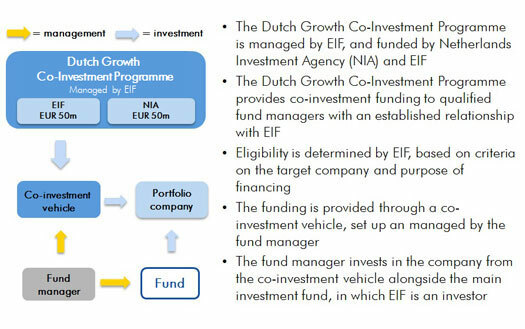 The Dutch Growth Co-Investment Programme is a EUR 100 million equity co-investment scheme developed by EIF and the Netherlands Investment Agency (NIA) and managed by EIF, to be invested alongside private investors with the objective to catalyse at least another EUR 100 million of growth capital to target companies. It is a joint initiative by EIF and the the predecessor of Invest-NL, NIA, which contribute a financial allocation of EUR 50 million each. The Dutch Growth Co-Investment Programme was launched on 27 September 2017. The objective of the Dutch Growth Co-Investment Programme is to support innovative Dutch enterprises, by providing co-investment funding alongside equity investment funds and private investors on market terms and conditions. It will focus mainly on SMEs and small midcaps with a strong growth profile, and is targeting the "second equity gap” that companies face when they move beyond the start-up stage and into the growth phase of their lifecycles. EIF is currently managing and deploying already two other programmes on behalf of the Dutch Ministry of Economic Affairs: the Dutch Venture Initiatives and the Business Angels co-investment programme EAF Netherlands. The Dutch Growth Co-Investment Programme will be the third initiative undertaken by the EIF and the Dutch Ministry of Economic Affairs, through the NIA, which illustrates the strong partnership and mutual commitment to provide further support to SMEs and smallcaps in the Netherlands. It is also one of the first financing programmes launched by EIF under the EIF-NPI Equity Platform and the Investment Plan for Europe in cooperation with EU National Promotional Institutions. The NIA became an aligned member of the EIF-NPI Equity Platform’s General Forum in September 2016. How does the Dutch Growth Co-Investment Programme work? EIF will manage and deploy the Dutch Growth Co-Investment Programme through co-investments into companies alongside investment funds in EIF's portfolio, a list of which can be found here. The co-investment capital will be provided through a co-investment vehicle, which is set up and managed by the fund manager. The fund manager will invest in the target company from the co-investment vehicle alongside an investment from the main investment fund. The size of investment will be assessed in each case. Are you a fund manager interested in partnering with us under the Dutch Growth Co-Investment Programme? The financing provided to the company must be for the purpose of supporting growth, expansion or acquisition financing, provided in any case that a majority of the financing is in the form of a capital increase.